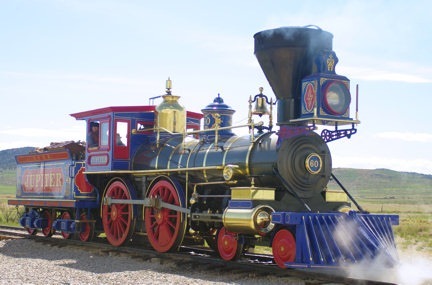 Special events fill May 10th at Golden Spike National Historic Site in commemoration of the meeting of the rails. 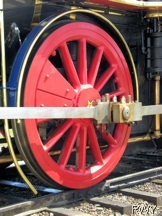 Replicates of the original engines – the Jupiter and No. 119 – will be steamed up and riding the rails. 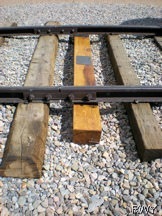 Clad in 1869 period clothing, portrayers will re-enact the driving of the last spike as track-laying crews came together working from the east and the west. 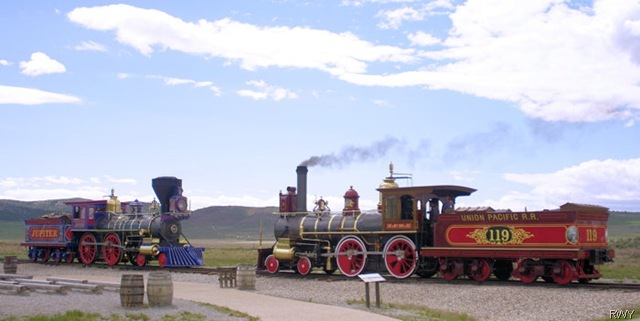 After hearing from more than one source that the Golden Spike National Historic Site was well worth a visit we made the detour to Promontory Summit last summer. We assumed we’d make the 32-mile drive west from Brigham City, see all there was to see in less than an hour and be back on our journey. We stayed the entire afternoon. 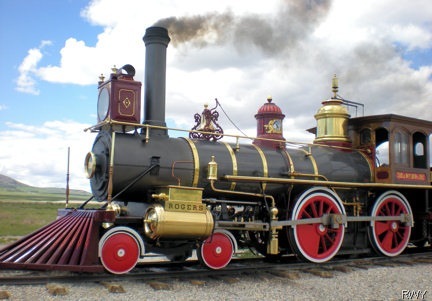 The film, Golden Spike, shown in the Visitor Center offers an overview of the challenges of building the nation’s first transcontinental railroad. During the summer the replica locomotives emerge from the engine house and puff their way to the site each morning. Under a full head of steam, clanging of bells and whistles they make the return run each afternoon. Central Pacific’s president, Leland Stanford arrived for the ceremony on a special train pulled by Jupiter. No. 119 brought dignitaries and Union Pacific vice-president Thomas Durant to Promontory. Among the interesting trivia we learned was that neither of these engines were the ones originally planned for use at the ceremonies. Both original engines were sold as scrap for $1,000. in the early 1900s. The beautiful reproductions were commissioned into service in 1979 on the 110th anniversary. Trains of that time were painted these bright colors. It wasn’t until the 1900s that black became the standard. Volunteers in the role of dignitaries present at the Golden Spike ceremony re-enact events on Saturdays and holidays between May and October at 11am and 1pm. We were enlightened by rangers making scheduled presentations trackside, mixing factual history and fascinating anecdotes. For instance, the golden spike was for ceremonial purposes only, it would have shattered if driven by a maul (spike hammer). There were actually two original golden spikes; one is in a museum at Stanford University, the other has disappeared without a trace. With plenty of time before watching the trains made their returns to the engine house we drove the 7-mile West Grade Auto Route which follows the actual Central Pacific Grade. After our visit we’re quick to agree with our advisors, It’s well worth the trip. When You Go: No services are available in the park, if you plan to spend several hours come prepared with food. Only water and cookies are sold at the Visitor Center. The nearest gas station is 26 miles away in Corrine. If you’re concerned about weather conditions call 435- 471-2209 ext. 29. The Visitor Center is open 9am to 5pm daily except New Year’s Day, Thanksgiving, and Christmas. Outside attractions are open during daylight hours.